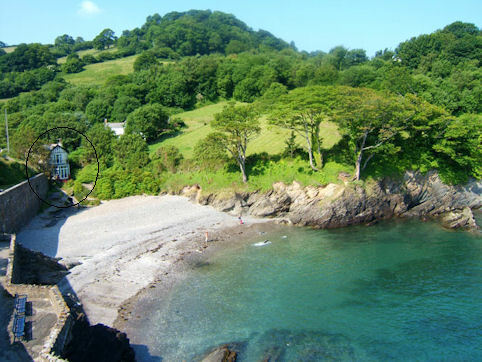 Newberry Beach House is a detached four-bedroomed cottage nestling right on a beach in Combe Martin at the heart of the North Devon Area of Outstanding Natural Beauty. At the rear of the Beach House, the garden gate leads directly onto Newberry Beach which provides excellent rock-pool fishing for inquisitive children. 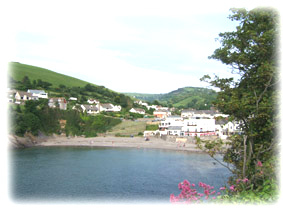 Newberry beach is adjacent to Combe Martin Beach which is larger and sandier. One of the main attractions of Beach House is not having to walk along or cross any roads to get to the beach. In fact at low tide you can walk directly from the back garden to the local pub (The Foc'sle) via the beach without stepping on a road or a pavement! Dogs are permitted on Newberry Beach year round (and indeed one small, well behaved dog is welcome at Beach House). On adjacent Combe Martin Beach, dogs are not permitted from May to September. Although the beaches do not have life-guards, the local authority checks the quality of the sea water to ensure it meets EU standards. The information is posted on a board at the entrance to Combe Martin Beach. The front garden gate of the cottage leads directly onto the South West Coast Path which provides walkers with unrivaled views of some of the most breath-taking scenery in the UK. If you are arriving at Beach House by car, off-road parking is available in a secure garage at the front of the house. 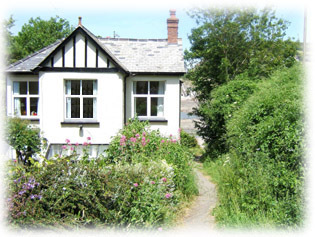 The Beach House is centrally heated and sleeps 8 comfortably in four bedrooms, one of which is in the ground floor annexe. There is also a foldable cot for an infant. Two of the four bedrooms have ensuite facilities while the rear bedroom has a balcony with spectacular views over Combe Martin Bay and towards Lester Point and Hangmans Hill. Downstairs, Beach House has a lounge with Sky TV Sports and Movies package, separate dining room with open fire, a fully-fitted kitchen and a conservatory leading out to a small patio that overlooks Newberry Beach. Beach House guests now benefit from our new uncapped BT Wireless Broadband service. You'll be sent details of the WiFi access key and the Sky TV Pin number when you make your reservation. Flanked by the beach at the rear, a footpath to the beach at the side, a fresh-water stream on another side and the South West Coast Path at your front gate, we hope you'll agree that Newberry Beach House enjoys one of the most enviable holiday home locations in the British Isles. With national treasures such as Lundy Island nearby and Exmoor National Park, superb golfing on the championship links at Saunton as well as Combe Martin's own Wildlife and Dinosaur Park just minutes away, we're sure you'll want to explore further afield, so why not take a look at our suggestions for things to do and see in the surrounding area to make your visit a very special holiday for all ages.